We are blessed with an extraordinary number of local artists and crafts people. For example, you can see at least 18 different studios around Cardigan Bay through the Open Studios initiative www.cardiganopenstudios.co.uk. This peaks around the August Bank Holiday. http://www.artholidayspembrokeshire.co.uk You might want to have a go yourself – Studio Llwyndrain – Art taster days – be creative together as a family. Newcastle Emlyn, 4 miles away, has even more talented local artists – Gabrielle Dudley’s gallery is worth a visit – she paints beautifully and produces the most amazing tiles: www.gabriellesgallery.co.uk . The Makers Mark gallery showcases many local artists and crafts people, including another local artist from Newcastle Emlyn – Helen Elliott www.helenelliott.net and Diane Matthias from Henllan, just up the road http://www.dianemathias.com We also have Sculpture Heaven – a beautiful garden not far from Newcastle Emlyn, showcasing their stunning sculptures http://www.sculptureheaven.co.uk – we own several examples of their work. A visit to the galleries along King street in Carmarthen, near the castle, is a must for art lovers. www.raulspeek.co.uk A very colourful gallery showing the work of this talented Cuban artist in beautiful Solva. www.orielyparc.co.uk St Davids visitor centre with a selection of crafts, artist’s materials and a stunning art gallery. www.thestudioatpenrallt.co.uk Penrallt Farm, Newport. Owned by artists Helen Beazley and Marc Morley (Helen writes the Lavender Road series under the name Helen Carey). There is a long history of rail travel in this part of Wales – On 25 March 1807, the first railway passengers in the world traveled on a railroad carriage converted to carry people and drawn by a horse between Swansea and Mumbles. We still have steam trains running in the local area on preserved railways. Two are within 25 minutes drive – the Gwilli Railway on the way to Carmarthen and the Teifi Valley Railway, upstream from Newcastle Emlyn. A third, the Reidol Railway, starts at Aberystwyth. http://www.gwili-railway.co.uk/ Gwili railway – a restored standard gauge steam railway running through a beautiful valley near Carmarthen. A round trip takes about an hour but you can travel all day on one ticket. There are plans to extend its current route all the way to Carmarthen and up to Pumpsaint, following the Gwilli river. http://www.teifivalleyrailway.wales/ – Narrow Gauge Steam Railway – The journey runs through woodland and then on to a steep shelf above the beautiful River Teifi. They also have a woodland walk and crazy golf. http://www.rheidolrailway.co.uk/ – The Reidol Railway – a powerful narrow gauge steam locomotive working hard to climb 700ft (200m) in the 11 ¾ miles from Aberystwyth to Devil’s Bridge. This was the last steam railway owned by British Rail until it was privatised in 1989. The journey takes around an hour each way with time to sight see at Devil’s Bridge. http://www.greatlittletrainsofwales.co.uk/vor.html – you might also like to look at the other steam railways in Wales. We’d love to show you around the mill gardens. We have flower gardens all around the mill, along the leat and even into the next county. We have soft fruit on terraces up the hillside and orchards on the hillside. Hardy fushias, geraniums, peiris and rhododendron grow particularly well here. We have a herb garden in a raised bed alongside the driveway which is very attractive to bees and butterflies. There are 3 gardens at Park Villa- the one directly in front of the Villa is paved. The garden going up the hill is terraced and full of flowers and places to sit. The garden going down the hill is mainly laid to lawn with a BBQ area and steps down. We are specialising in hydrangea and fushias in that garden. The wild flowers in the woodland and meadows around the mill should count as a garden in their own right, starting with snowdrops clustering along the river sides in January/February. Bluebells fill the woods in May and orchids can be found along the roadsides. The verges and hedgerows are a riot of colour in June and laburnum trees hang golden chains above the country lanes. The long hot days of summer mean pleasant walks in shady woods and autumn brings vibrant colour to the valley. Then winter paints it all with a silver sheen and the snowdrops start again. There are many other beautiful gardens for you to visit including the Garden of Wales and Aberglasney. Rhododendrons are a wonderful sight in June and Picton Castle’s display is breathtaking, while the great glasshouse at the Garden of Wales is amazing, even in Winter. There are also interesting nurseries to visit and many of our guests leave with plants. http://www.aberglasney.org – Aberglasney gardens – a garden lost in time. http://www.pictoncastle.co.uk/ Picton castle – the rhododendrons are breathtaking. http://www.norwoodgardens.co.uk/ Norwood Gardens – 3 acres with the “long walk” and individual gardens on each side. http://www.trefhedyn.co.uk/ – Trefhedyn nursery in Newcastle Emlyn. Well worth a visit. It looks small from the street, but take a look round the corner! 10 minutes drive from the mill. http://www.penralltnursery.co.uk/ – Penrallt nursery in Moylegrove “possibly the largest, most comprehensive collection of plants in West Wales”. The only nursery we know with a sea view. Good cafe there too. 25 minutes drive from the mill. http://www.newbridgenursery.co.uk/address.html – Newbridge Nursery & Plant Centre open during the summer in the heart of the Pembrokeshire countryside near Haverfordwest. http://freespace.virgin.net/christina.shand/index.htm – Dyffryn Fernant garden near Fishguard. open Weds – Sun Easter – Sept.
http://www.moorlandcottageplants.co.uk/ Moorland Cottage Plants near Crmych – note they also do mail order. There is a wealth of local food to try, from Cardigan Island crab to Caerphilly Cheese and even Welsh Whisky. The local town, Newcastle Emlyn, has 2 lovely delicatessens selling a variety of Welsh Produce. There is an organic fruit and vegetable shop (so so good – look out for the pies and nom nom chocolate) a good butchers and an excellent health food shop. The market on Fridays brings local jam makers and honey producers to the town, amazing fruit and vegetable bargains are to be had and the Country Market offers local produce, cakes, bread and crafts. Nearly every weekend, there’s a food festival somewhere in Wales. The Garden of Wales’ food fair is at the end of May. Newcastle Emlyn holds its food fair in June. 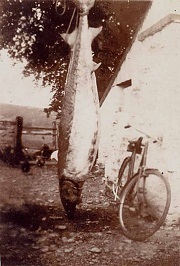 Pembrokeshire Fish Week is at the end of June. Carmarthen food fair is in July, as is St David’s Really Wild food festival. Narberth’s food festival is in September. There are lots more. There is plenty of good Welsh Beer around – Felinfoel, made near Llanelli, Thomos Watkins, made in Swansea, Brains, made in Cardiff etc.. There are many good pubs just a short drive away, serving local produce at reasonable prices. Our local, the Nags Head at Abercych, is a microbrewery, serving its own fine beer. There are a variety of pubs serving food in Newcastle Emlyn: The Coopers Arms, The Three Compasses, The White Hart Inn, The Pelican, The Ivy Bush, The Plough, The Gwesty’r Emlyn Hotel. There are lots of lovely cafes and restaurants there too: Harrisons Bistro and Riverside Gardens, Pachamama Bistro, No 11. The Central Cafe does great fish and chips to take-away and there are Indian and Chinese take-aways in the town. Yasmin’s indian restaurant has been the “Best Curry house in Wales” recently . Just down the road at Cenarth, you will find another fine selection of pubs, cafes and restaurants. Further afield, you will find beautiful pubs overlooking secluded bays or in bustling towns. For a real holiday feel, there are amazing fish and chips in New Quay, Saundersfoot and at Llangrannog, where the local ice-cream is a treat. There are even some cafes where your children can paint their own pottery. You will also find lots of farm shops and farmers markets, local cheese makers, a vineyard and a honey farm. – including cheese, wine and chocolate!! http://www.cawscenarth.co.uk – Caws Cenarth – organic cheese factory. See the cheese being made and sample the wonderful organic cheese, which regularly wins major prizes. 10 minutes drive from the mill. http://www.thehoneyfarm.co.uk – New Quay Honey Farm – Discover the magical world of the bee. http://www.cwm-deri.co.uk – Cwm Deri Vinyard. Excellent wine tasting opportunities and a great restaurant. http://www.llwynhelygfarmshop.co.uk/ Llwynhelyg Farm Shop 8 miles North of Cardigan “a food lovers’ paradise” an excellent place to get lots of local food. http://www.welsh-whisky.co.uk – Penderyn Whisky Distillery – near Merthyr Tydfil, a little way from the mill but worth a visit for Whisky lovers. Or you can buy their produce in Carmarthen. http://www.gwaunvalleybrewery.co.uk/ – Cwrw Cwm Gwaun real ale brewery – see the brewers at work and taste the finished product. Carmarthen – Wednesday. The indoor market is open Tuesday – Saturday. Cardigan indoor market – open most days but Thursday – Saturday is best. You can come and go as you please here, so you can play as early or late as you want. You can enjoy an indoor riding lesson at Starlight riding centre, a couple of miles from the valley; or what could be more memorable than a gallop through the surf with Marros riding centre or East Nolton riding stables. http://www.marros-farm.co.uk/ Marros riding centre – Beach rides, own a pony days. You will see a variety of birds from your mill apartment window, including wagtails, dippers, woodpeckers, buzzards and even kingfishers, red kites, herons and pied fly-catchers if you are lucky. Each apartment has its own bird spotting book and you are welcome to borrow the field glasses from the summer house. Pak Villa has more woodland birds and the wagtails are different there – pied rather than grey (which are actually very yellow). You’ll still see the buzzards and we saw a barn owl from there, silently travelling down the valley, one still summer night. The Teifi marshes nature reserve, with its hides, cafe and water buffalo, is 20 minutes drive away. Then there are the coastal paths and boat trips to places like Ramsey Island and Caldey Island. Visitors often make the trip to the red kite feeding station, where the displays are breathtaking. A visit to the National Wetland Centre at Llanelli is definitely worthwhile, if only to feed the Hawaiian geese from your hand. http://www.rosemoor.com/IPFiles/Nationalpark/skomer.html – Skomer Island – A short boat trip to one of the best birdwatching spots in Britain. http://www.welshwildlife.org/ our local wildlife reserves – there are 15 in Pembrokeshire (including the Welsh Wildlife Centre at Teifi Marshes – a significant reserve, 25 minutes from the mill) 12 in Carmarthenshire and 20 in Ceredigion. This site also has information about Skomer and Skokholm Islands. http://wwt.org.uk/llanelli National Wetland Centre Wales at Llanelli – bird watching & wetlands you can explore by bike and canoe. http://www.pembrokeshire-falconry.co.uk – Pembrokeshire Falconry Experiences – try handling falcons in the beautiful Pembrokeshire countryside. http://www.oakwoodthemepark.co.uk Oakwood theme park – Speed, Magophobia, Vertigo and Drenched should hit the spot. http://www.celticquestcoasteering.com a really active way to explore the Pembrokeshire coast. http://www.ritec-valley.co.uk – Ritec Valley Quad Bikes – For Adult and Junior riders. http://pembreycountrypark.wales/ Pembrey Country Park near Llanelli, with a dry ski slope & toboggan run, cycling trails & bikes to hire, horse riding, an amazing beach.